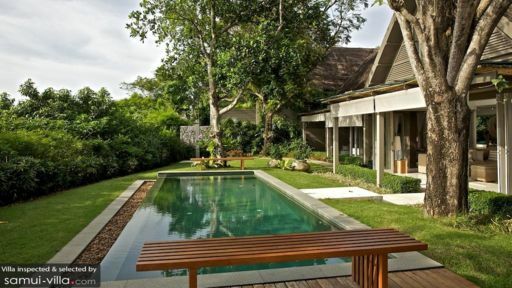 The Headland Villa 5 is an elegant private retreat on Taling Ngam Beach, Koh Samui, that is the quintessential holiday home for guests who are travelling with their families. With something for adults and kids alike, the villa even provides direct access to the beach front the estate’s entrance. 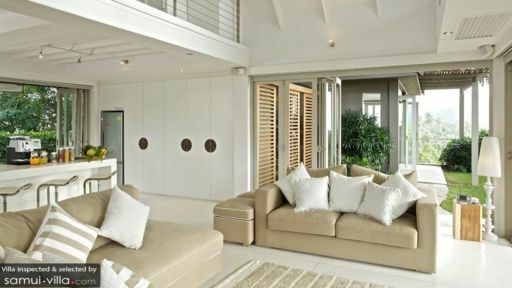 The villa is awash with pristine white interiors, classy furnishings, open spaces, and comfortable lounge areas. There are four bedrooms at the villa, each with comfortable beds and other amenities. With outdoor dining to make all your tropical dreams come true, The Headland Villa 5 will never disappoint! The villa appoints four bedrooms and three of them open out to the gardens directly thus, offering calming views through the glass doors right as you wake up in the morning. Each bedroom has been designed with a minimal theme featuring white interiors with specks of gold as seen in silk cushions and artwork. The fourth bedroom is on the mezzanine furnished with singles well-suited for kids. Two of the bedrooms are furnished with plush king-sized beds whilst the third is also furnished with single beds and is attached to the media room. With each bedroom, you will find an en-suite bathroom in which two are partially open-air with a pergola roof, plenty of greenery, and gorgeous natural stone bathtubs. Greeted with panoramic views of the ocean, nearby islands, and the villa’s own lush tropical vegetation will put your mind at rest. A shimmering 8.6-metre swimming pool invites you in to take a refreshing dip to start off your tryst with the beautiful outdoor. Relax and stretch on the lounge chairs, or find your away under the thatched-roof sala furnished with comfortable sofas. A wooden bench stands on either of the pool’s edges for when you wish to dip your feet in and lose yourself to these heady surroundings. Since the villa is utmost luxury in the most understated and minimal way, the open-plan living room is truly something to behold with its calm, beige tones, whitewashed walls and high-soaring ceiling. Furnished with a comfortable sofa set that sits right in the centre next to the glass doors that allow you access to the pool deck without a hassle. Move around the villa with ease when everything opens out to the gardens to make the most of your time here. The living room is air-conditioned and therefore, can remain closed for a cooler ambiance. Right next door is the media room that kids would love to spend time in as it is equipped with a colourful sectional sofa, movie equipment, and a foosball table! You will be happy to know that The Headland Villa 5 has an alfresco dining area situated under the clear blue skies with a chic ten-seater dining table. If you wish to cook, the fully-equipped western kitchen is all set for use complete with a breakfast bar and barstools. The villa not only offers plenty of modern amenities including a fully-serviced study room with a desk, TV, and seating, it also provides staff services in the form of housekeeping, security service, etc. If you wish to travel around the island, chauffeur-driven cars can be arranged upon request at an additional cost. The staff can call in professional therapists to give you indulgent massages and therapies as well for a charge. Located right on Taling Ngam beach, you are in for a treat since this is a more laid-back and unfrequented bit of the island with scarce crowds. Enjoy a tranquil moment to yourself while laying back on your beach towels and enjoying the sun on your skin. You can choose to eat at one of the nearby restaurants like The Virgin Coast for exceptional seafood and local dishes! 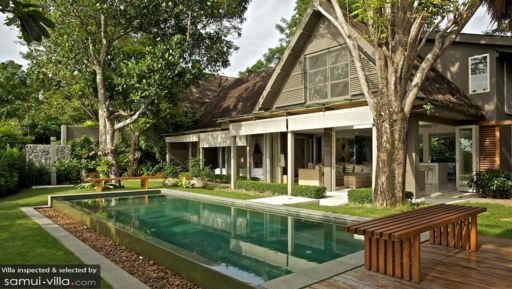 Villa 5 is the flagship property at THV. The villa is perched on a low cliff top boasting 280degree views - the ocean to the front and the mountains to the rear. The villa is even better than shown in the photos and the staff and service are simply fabulous - undersold and over delivered. A beautiful forested path leads to the beach where the Intercon Hotel allows guests to use their gym, paddle boards and very long pool. K Lek the VM is very obliging - easy walk to several small restaurants - order in or ask for a chef for the day. So much to day and yoga and massage daily. A great holiday. We had a weeks holiday at Headland Villa 5 my husband and I were happy to stay in the villa the whole time, as it was so beautiful, a great view, so relaxing and a divine villa. However we did go on a few day trips with the family and Lek helped us decide what to do and where to go. Her advise was always very thorough and she made sure all our needs were met. She was a wealth of information, friendly, efficient with a good sense of humour. Lek 2 was also lovely she made us a beautiful breakfast every morning of fresh fruit and eggs and kept the house spotless, did our washing ...the best folder ever! Boy also kept the villa, pool and garden clean and was always friendly and kind. We had some delicious Thai dinners cooked for us. It was an indulgent family holiday, made so enjoyable because of the friendly staff.